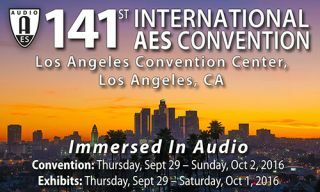 The Audio Engineering Society has unveiled a detailed calendar of events for the 141st AES International Convention in Los Angeles, taking place Thursday, September 29 to Sunday, October 2, 2016. With a full range of events and presentations spanning all segments of the audio industry, the AES Los Angeles Convention offers four full days of information and inspiration, led by industry leaders in science and practice, with attendance packages suited for every level of audio professional, student, or enthusiast. From the latest research and technology presentations to the largest pro audio gear exhibition and showcase of the year, with many of the greatest ears in audio in attendance, the AES Los Angeles Convention is the place to truly immerse yourself in audio. Many events, including the gear exhibition, are free to attend with an Exhibits-Plus badge, or attendees may choose to maximize their experience with an All Access badge for admission to the complete technical program. The preliminary calendar is available here. Early bird pricing ends August 30; register now for the very best deals on the convention program and on accommodations while in Los Angeles. The AES Los Angeles technical program and events calendar, both online and in the free AES Events app, provides the clearest overview of the wide array of events covering broadcast and streaming media, recording and production, game audio, live sound, networked audio, product design, sound for picture, and more. Sessions are laid out according to areas of interest, with varied program material featuring tutorials, workshops, research paper presentations, and engineering briefs, as well as a host of special guest speakers, expert panel presentations, and face-to-face networking opportunities. Additional student and career events, historical sessions, tech tours, standards meetings, and other standard AES Convention programs will also take place.